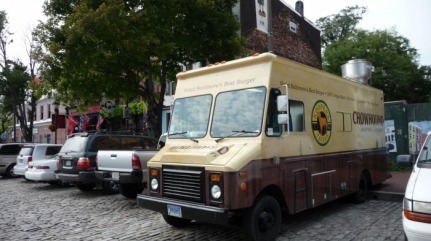 If The City Shuts Down Food Trucks, What’s The Next Big Trend in Lunch? If traffic has seemed to move faster and parking spaces have become more available in the last 24 hours, it might be because Baltimore City sent some obscure bureaucrat out onto the streets at lunchtime yesterday, a day after this article was published, to shut down the ever-growing fleet of food trucks that has been dieseling all over downtown and the surrounding neighborhoods the last couple of years. We were able to watch the whole thing unfold on Twitter, as well as following the live updates on the Dining at Large Blog on the Sun’s website. It almost seems as if social media, the food trucks’ greatest advertising asset, could also be their downfall, since the Mayor is on Twitter too, and can see exactly where to levy fines. Of course, twitter is a good way to yell at city officials as well, and there was no shortage of that until the operators of food trucks, the upscale ones anyway, were granted an indefinite reprieve later in the afternoon. One of Charm City's many mobile nosheries. The Chop is a bystander in all of this. We typically aren’t around downtown during the lunch hour, and even if we were, we’d favor an actual restaurant like Werner’s or Burke’s. (Oops. Guess we’re SOL, huh?) We see food trucks mostly as a trend and a fad, and we don’t think Baltimore could support many more than it has now anyway. In the meantime we’re kind of dubious about the whole notion of ordering and eating as quickly as possible. If you’re not getting a full hour for lunch, you’re getting screwed. We’d rather stick with table service. It got us wondering though… if the streets were emptied of food trucks, what will be the next great trend for lunch in Baltimore? Tugboats and gentrification have historically not mixed in Baltimore. Maybe food is the missing link. 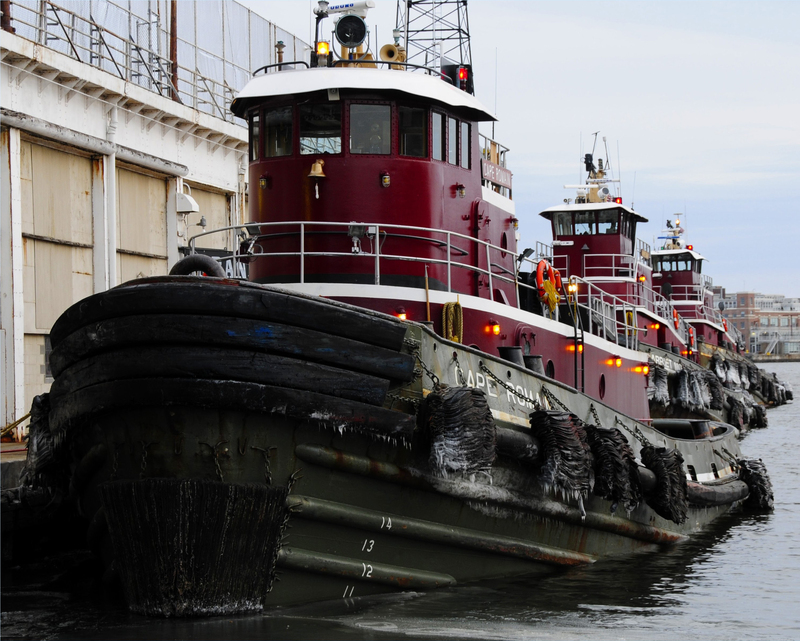 Tugboats have long been renowned for their excellent food, and they’ve all got galleys already built right in. This was the next logical step in foodie fads anyway, wasn’t it? We can see it now, some enterprising chef steaming back and forth between the Inner Harbor, Fell’s Point, and the new Under Armour compound at Locust Point, with customers sitting out on the stern eating $12 bowls of pea soup and posting pictures to Facebook. 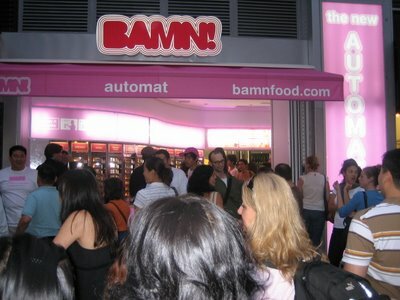 A bunch of trendy New Yorkers line up to buy junkfood from a wall. Return of the Automat. Most people in today’s workforce are far too young to remember the automat, But it ticks all the boxes on the potential food trend checklist: Arcane and obsolete? check. Made for the Poor, re-sold to the Rich? check. Plain food with the potential for dressing up needlessly? check. A novelty which is more about the experience than the menu? check. Nostalgia for something you never lived through? check. Potential to overcharge? That’s a check, my friend. There’s even a template to follow. It seems New York City has a shiny new upscale automat on the formerly gritty Saint Mark’s Place, complete with ‘opulent brownies’ and ‘Tijuana Taco Krokets.’ Their over-designed website even features a full page of schmoopy media gushing. Since Baltimore pretty much stole the whole foodie-food truck idea from NYC anyway, we might as well pony up $200k and jump on the automat franchising opportunity before the trend peaks. 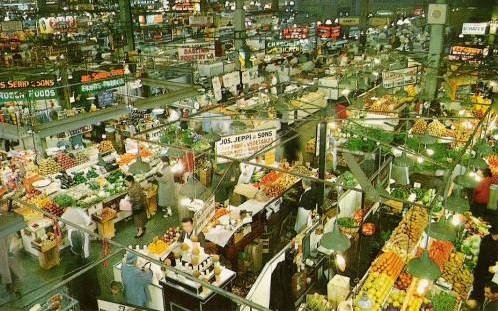 Lexington Market is "ripe" for gentrification. Lexington Market. Lexington Market has long been ripe for gentrification by the downtown lunch crowd, yet in 220 years of operation, it’s managed to retain its character. ‘Authenticity’ is at a premium these days though, and it could be the only thing that’s saving Lexington Market from an influx of suburban office workers is the fact that Polock Johnny’s isn’t nearly as adept at rebranding, merchandising and franchising as say, Ben’s Chili Bowl has been. Of course, it’s kind of tough to repackage the working class experience with all those pesky working class folks hanging around and ruining it for the rest of us. If Lexington Market is ever going to become Baltimore’s hot new food destination, we’re going to have to cut off bus and subway access, and add some valets to the garages. After all, that’s not the safest neighborhood for parking your Prius. Why do you think you don’t see more food trucks there? I think this article and the stance taken against food trucks is rather ignorant. I recently moved to Baltimore from DC, but grew up in Tulsa. The difference between Tulsa and DC is drastic, and Baltimore is somewhere in between. Catering to whinny people to address a traffic problem downtown (I’m pretty sure that’s the definition of driving downtown in any major city) only cripples the development of the city and puts boundaries on the opportunity for it to excel. Albeit, food trucks are trendy, but I disagree it’s part of the “gentrification” of an urban city, rather caters to the masses through a smart marketing approach and a way to disseminate a business’ product. There are multiple examples of current restaurant owners who originally started with a food truck/cart. Furthermore, food in general is a constant trend/fad. I’m unsure what you mean by Baltimore ‘s unable to handle anymore trends/fads, but restaurants constantly cycle in and out for that very reason, which also provides business growth and cultural development for a city like Baltimore. I stay firm with the stance that when a city takes such a strong stance on an evidently popular trend, it only hurts the city, not build it up. I’m glad to see the “City ” reissued a statement in attempts to compromise, but should have been the approach from the beginning. Perhaps a sign of the abilities and connection these officials actually have with the city vice their own pockets and motives. I don’t know about the rest of the city, but my love of the food truck is my inability to eat at the same handful of greasy spoons over and over again. I’ve worked in the same neighborhood for 6 years and great googa mooga, I can’t stand the sight of some of these places any more. Having a little variety in my lunch time slog is a pleasant change of pace.